I made an evaluation page for the students to fill out for me. In classes taught by Dr. Eller, she provided us with this tool for elementary students to evaluate others, I thought it would be very appropriate to use for this purpose. As I passed the handouts to the students, I explained to them they have had three years experience of being students so they were well qualified to tell me two things they loved about me as a teacher (stars) and one thing they wished I could do as a teacher (wish). As they finished, I had them flip the paper over and draw me a picture while we waited for others to be completed. I asked them not to put their names on it, because I wanted them to be honest. 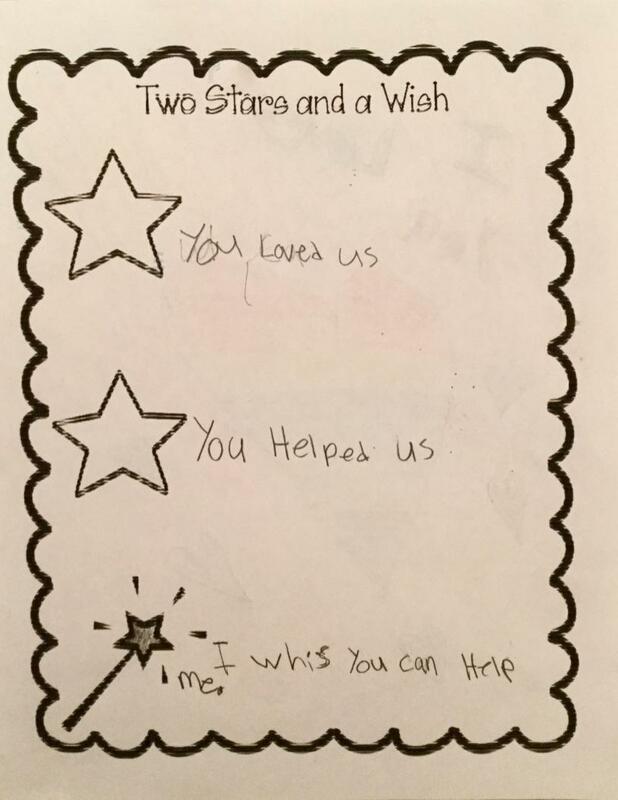 I have uploaded all of these to a document entitled, Two Stars and a Wish and I am highlighting a few responses that I find the most beneficial to my experience. Stars: “the videos helped me” (most popular answer), “the vocabulary words”, “I like about you is that you are fun”, “I liked the project”, “I think you are a good teacher because you help me with math”, “I think you are a good teacher because you help with writing”, “I also like the folder”, “I like that you did blurt beans”, “you loved us”, and “you helped us”. 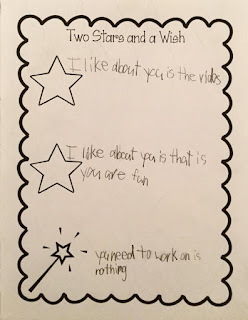 Wishes: “stay more longer”, “you need to work on nothing” (popular answer), “I don’t need you to do anything because your a good teacher”, and “I wish you can help me”. As I read these simple words from the students, they have profound meaning to me as a teacher. 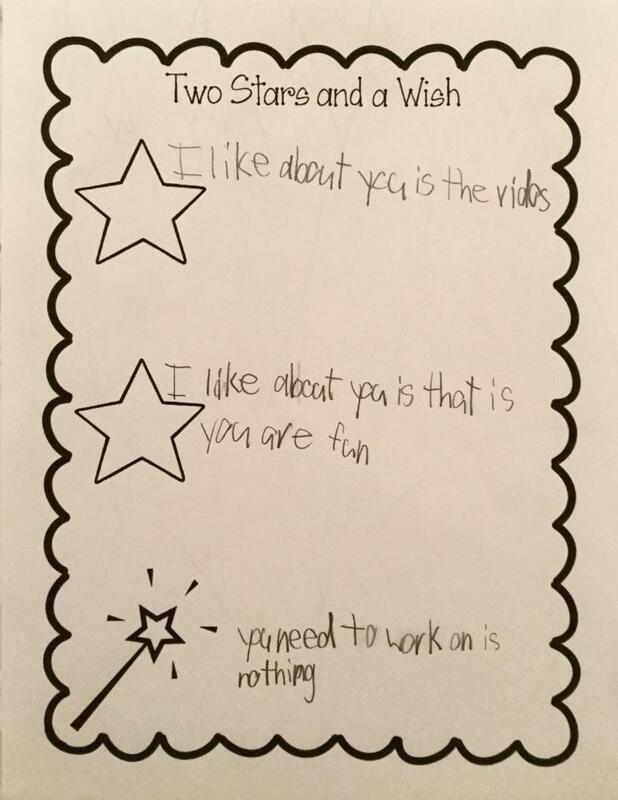 In reflection of these students’ evaluations, I gained wisdom to direct me in my future classroom. Relationships matter, I spent a lot of time getting to know them individually so I could teach them better. Interactive stories and hands on activities assist students of all levels, I spent a lot of time finding the right video or interactive story that would best teach the lesson I wanted them to learn. Teacher directed small group work is important, I took the time to work with those who needed extra assistance and I listened to their individual classroom needs. 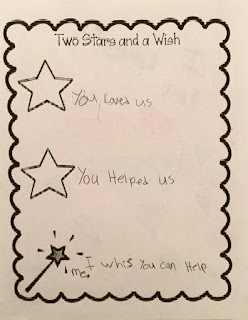 Expectations and directions are appreciated by students, I completed research to assist with the classroom management issues and I found a way to assist them toward better behavior during instruction time. Most importantly, the work is never done. There are still students who are in need of your assistance. There are only twenty-four hours in a day; however, at the end of the day if I can say I did my very best for every student in my classroom then I know that my day was a success. The next day will be a new day to do my best for those students who are so deserving, as well as the next day, and the day after that.